Christmas music instantly launches me into the Christmas spirit. The soundtrack of the season is available everywhere we go—in stores, on the radio, from the carolers on the street corner to the majestic stage of the Mount Baker Theatre. Available in all shapes and sizes, transcending genre, and sprinkled across the decades, the most popular Christmas songs have been covered and rereleased repeatedly. From classical, jazz, and pop to funk, soul, and rap, if you look, there is something for almost everyone. Here are four playlists you can set up instantly to get into the spirit. I picked songs and albums our melting pot Christmas culture looks forward to hearing each year. What music transports your family into the Christmas season? It is an act of bravery on the part of the artist to cover a classic Christmas song, and even bolder to write their own. It is because of popular culture that many of our most favorite holiday songs have managed to hang on over the years, each due to their own particular appeal to audiences. A number of songs by the Trans-Siberian Orchestra (1990s to present) are perfect for those that need a little rock n’ roll in their holiday and are also among the top-selling of all time. Jingle Cats covers all your favorites including Silent Night in cat meows. Literally. 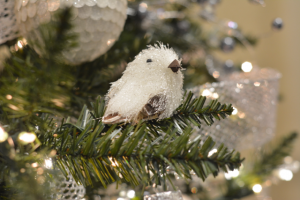 Decorations adorn your Christmas tree while jolly music – either contemporary or classical – sets the tone for the season. Classic Christmas songs can take you back… way back. You might remember the first time you heard the song, or when you sang it in a Christmas play at school, or along with the radio in your car. Some of my favorites are the most sentimental because they match the idealism of love, friendship, and generosity that I associate with the holidays. The entire albums of Ella Fitzgerald’s Ella Wishes You A Swinging Christmas (1960) and Spirit of Christmas (1985) by Ray Charles. Many say that the songs they sang in choir, while caroling, or performed as part of an ensemble are the ones that take them back to the old days or bring them into the spirit of the season. Now, follow a top-selling Christmas album to Mount Baker Theatre’s Main Stage. 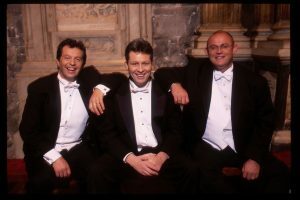 The Irish Tenors includes (from left) Finbar Wright, Anthony Kearns, and Ronan Tynan. The Irish Tenors will be performing at the Mount Baker Theatre on December 14. Photo courtesy: Mount Baker Theatre. The album is “We Three Kings,” and on December 14 The Irish Tenors will perform live from that playlist as well as from their vast repertoire of Irish and American standards. Pass through festive decorations in the lobby into pure tenor harmonies of this powerhouse trio. For music that is always a celebration, don’t miss the national tour of Broadway musical Mamma Mia! on December 18. You’ll be transported to a Greek island paradise with a mother, a daughter, and three possible dads for a funny tale that unfolds with beloved songs by ABBA. 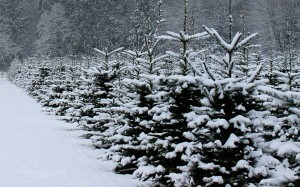 For a list of all holiday events at Mount Baker Theatre, from magic shows to dance, visit MountBakerTheatre.com. From everyone at WhatcomTalk and Mount Baker Theatre, we wish you and yours a very safe, and musical, holiday season.